For this blog, I am showing you one method of making your own sanded surface for painting with pastels. I do NOT like what is called "pastel paper". I always use one kind or another of the commercial surfaces made specifically for pastel. There are several ways to create your own, for more texture, or to save money, or just to experiment. This is one of those experiments. 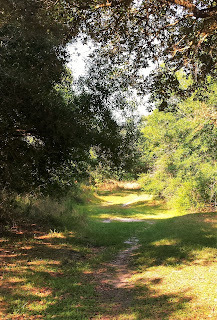 I am using my photo of a local park trail, but this method could be done en plein air too. Do the first step before you go out ...saves time in the field. Step 1. I started with a piece of acid free mat board, in a dull reddish color, with the waffle texture. I coated it , using a small roller, with clear gesso. This is what I used, to avoid confusion. Clear gesso. Goes on white, dries clear. I did two coats. You can use a brush to get more texture, if desires, but for this painting I rolled it on to make a uniform surface. Next blog will be fun with textures. Step 2. Now it's time for pastel. 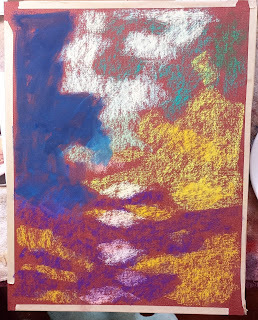 I used mostly Prismacolor Nupastels for this step, lightly stroking over the surface, for my underpainting.You can see the color of the mat board in the corners where the tape is not covering it. 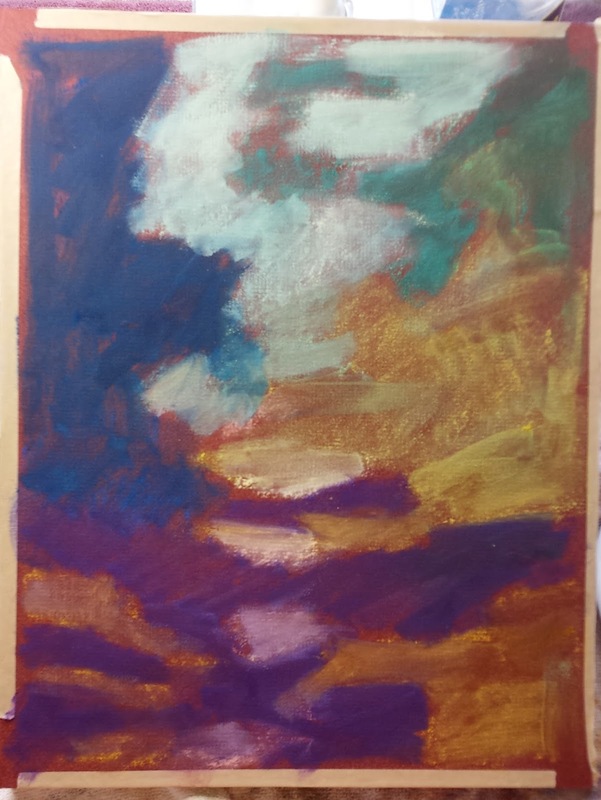 This will be a mostly green painting, so I used warmer colors, plus a dark blue for the deepest shadows. The dark blue has had the alcohol brushed on, as I start that step. I am already establishing my darker and lighter value areas, as well as the temperatures I hope to end up with. Here is what it looks like after I have brushed it with denatured alcohol. 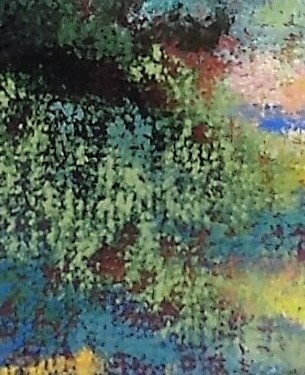 I used a 1/2" flat bristle brush, cleaning the brush between colors, so as to keep them separate. I use various brushes at different times. At this stage, it can look rather chaotic, so it's good to keep your reference photo nearby! Step 4. Now for the fun part, painting! I used mostly Terry Ludwig soft pastels, as I like the square shape, the heavenly buttery feel, and the size. I also use a few Schminkes, and Unisons, for their round shape and soft application. They blend over the Ludwigs beautifully. Here I have laid down the intended values and colors, working to get the atmospheric perspective indicated with cooler green-blue, as well as the cool shadows, and spots of sunlight on the foreground. 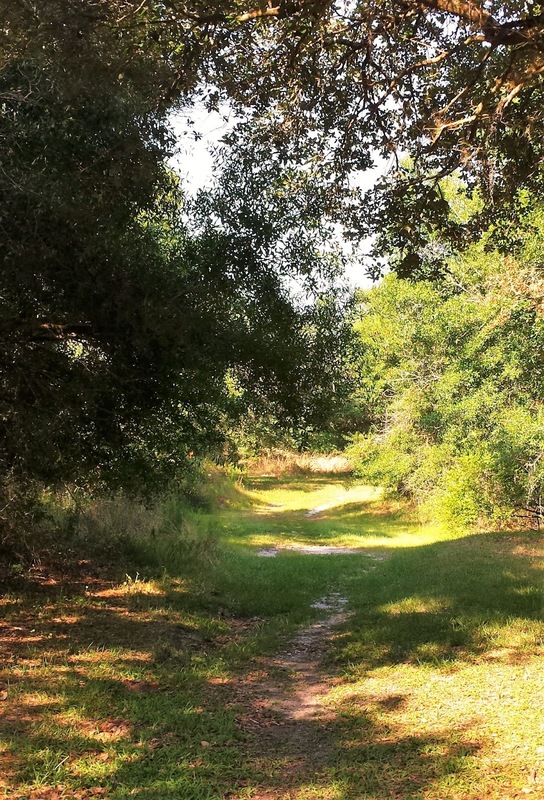 The sun is coming from the left, hitting those bushy trees on the right, so they get warm yellowish greens. Step 5 Problem. This surface is very gritty. With two coats, it has a less-than-matte finish, and I was having trouble keeping the pastel ON! Typically, as I work, I will tip the piece sideways and gently tap it against the table to shake off any loose dust. There is usually not much at all, when I use Ludwigs, regular sanded paper, and my light strokes. With this surface, a LOT of dust comes off. 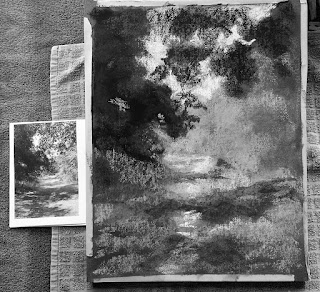 So I used "workable fixative" several times during the various layers. See photos below for what happens before and after spraying. I used Krylon, which promises "invisible protection without without dissolving whites and lights". See for yourself! Comparison photos below.Spraying definitely dissolved the top layer of light pastel, among other things. 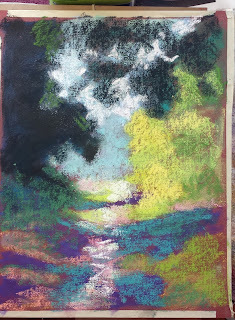 So I just kept applying pastel, and gave up spraying, after two tries. I usually give my paintings a hard tap against the table once they are ready for framing, to make sure there is little or no loose pastel dust that can come off under the frame. With regularly available paper (Uart, Pastel Premier, Art Spectrum Colourfix, etc) this is not a problem. .Step 6. To Finishing. 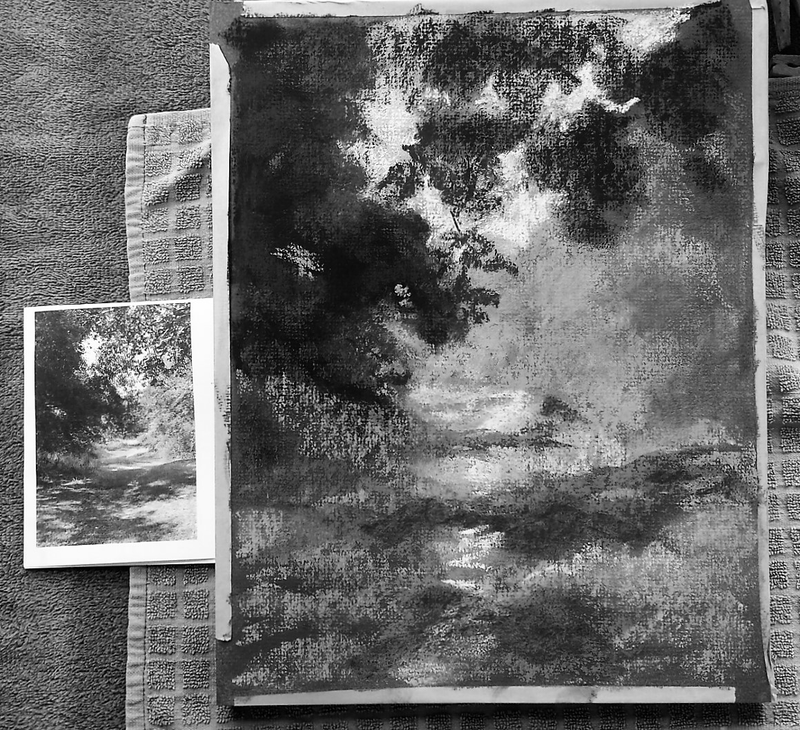 I wanted to make sure my values were correct so took a photo in grey scale, with the original photo of the scene. This was taken after the last spraying. I can see I need to lighten the overhanging tree branches, add more "sky holes"; brighten up the right trees, and especially lighten the foreground grasses and sun spots. "Out of the Shadows" 10" x 13" unframed. Available for $100.00, free shipping. Contact me here. 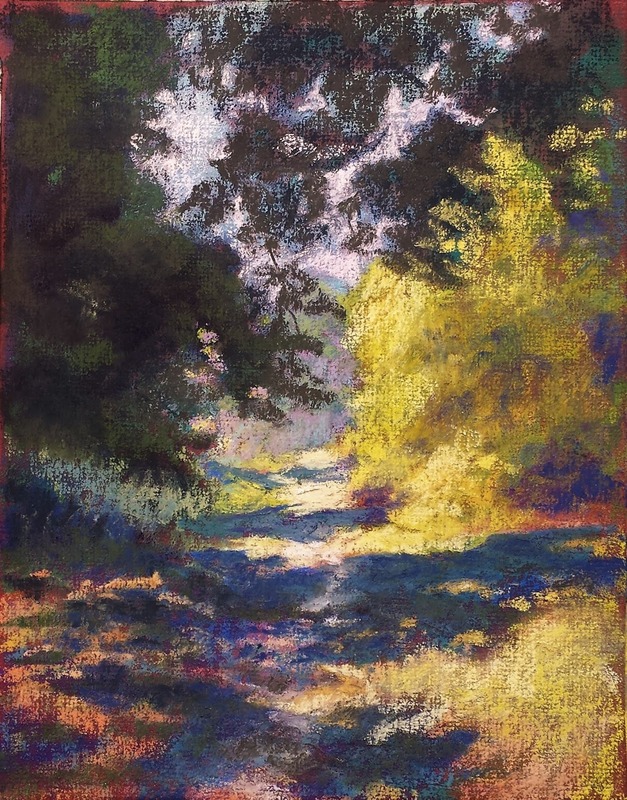 In the end, I decided to keep the overhanging branches dark, to give the feeling of deep shade. 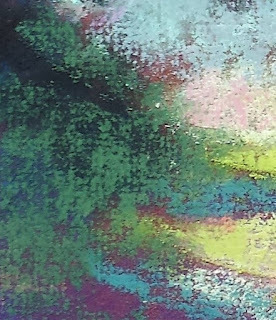 I am pretty happy with the result, but I intend to work more with this surface, on other paintings, to see if I can get a more adhesive surface, without using fixative. I will also experiment with this and other textural applications, to create paintings with actual texture...for grasses, perhaps a look of brush strokes. That will be next week's class, and blog. Clear gesso works really well as a primer. Liquitex is a good one. I don't like the surface of smooth papers. Colourfix Primers (the same stuff on Colourfix paper) is also fantastic and wonderful and amazing. 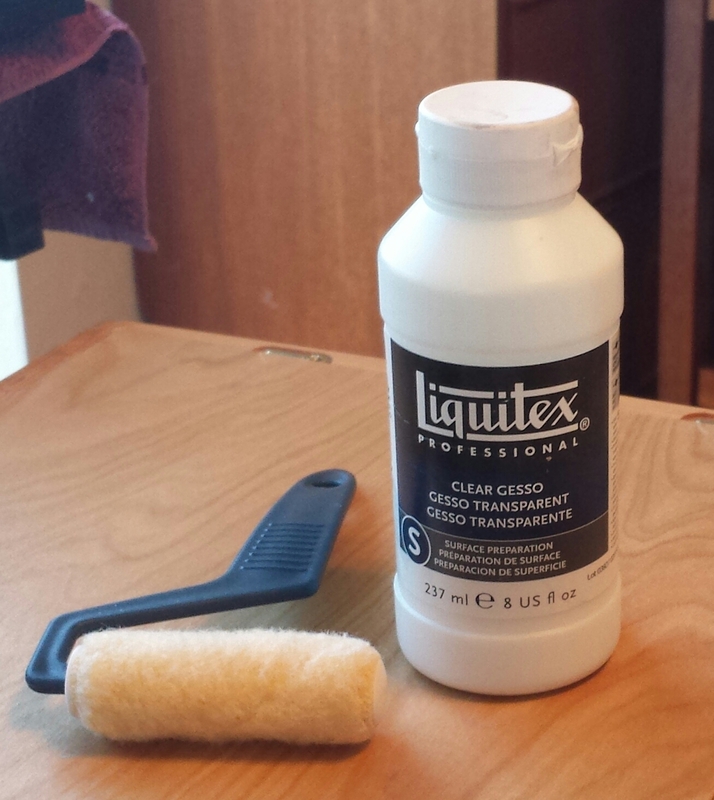 I use and teach all those you mentioned, and as you see in the photo, the Liquitex is the one in this blog. I want to show novices, or maybe those who want to learn more, what the different choices are. As I pointed out, I never use smooth papers. I will be doing a blog on using the Art Spectrum one, as well as Golden Fine Pumice Gel, and how they can be tinted, textured, etc. Thanks for your comment.